It’s Monday again, and I hope you all had a fabulous weekend. I’m excited to be hosting FMM so I hope you’re ready to get involved. If you want to join the fun all you have to do is copy this post to your own blog and share your own answers then take a few minutes to check out FMM posts by other bloggers. You can add your link at the bottom of this post. 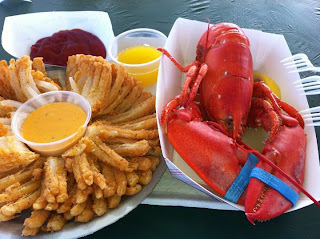 I ate lobster and we both ate a little of this blooming onion while my bestie enjoyed stuffed clams. 2) List two or three material possessions that you can’t live without: In the last few months I’ve learned that I don’t need a lot of the things I thought I needed to be happy. But I still can’t imagine not having my cell phone and laptop. These things are my connection to the world and the people I love who are far away. They keep me connected. Just saying. 3) Which day are you looking forward to most in the coming week? I love Thursdays because I look forward to weighing in then going out with friends. And now that college football has started I love Saturdays too. 4) Share one of your most embarrassing stories…It happened in January of 2009, a few months before I began my weight-loss journey. I’ve shared it a few times on my blog, but it’s still the most embarrassing moment so I’ll share it again now. “I suppose the easiest embarrassment I can recall was last January. (I posted about it, briefly, here.) I was just outside of the New York Public Library, it was bitterly cold outside. My friend, Mike, and I were walking down Fifth Avenue, and he said “Kenz, you must be freezing! Button your coat!” But I couldn’t do it. It was so tight that I could not keep the wind out even with a heavy scarf so as tears filled my eyes, I shrugged it off and continued walking down the street. This coat is way too big now. Just saying. But Mike pressed the issue again before realizing that tears were welling up in my eyes, and I had to admit that I had no choice because I could not actually button my coat. He began apologizing profusely. I could tell, at least at that moment, that his heart was breaking for me a little. He dropped the subject immediately, and we continued walking. 5) List three of your “must-read” blogs and tell us why we should read them too! 1. Shane’s blog, Losing It For The Family, is one of my current favorites. This guy is enjoying his personal journey to a healthier life. Happiness is oozing out of him even on days that aren’t easy. You should definitely follow him if you’re not. 3. Sara’s blog, Bombshell Beauty, speaks for itself. She’s beautiful and stylish, and she writes one of the first blogs I ever read regularly. Now it’s your turn to get involved and answers these questions. You can answer them here or in your own post. Just be sure to share a link so everyone can see it. Have a good week friends! Note: When adding your blog’s url, please be sure to include a direct link to your FMM post so you can receive comments from new and old blogging friends as well! awww I am so grateful for the kins words Kenz! You are so awesome! 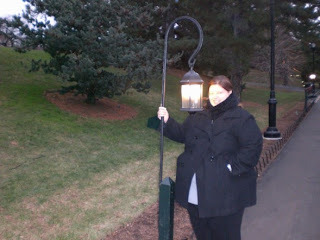 I think I have seen that picture of you in the coat before, but it really struck me today! Holy cow, you have come a loooong way baby! I wish I had your love for exercise gene. Kenz, how is the weight loss going? You didn't do an update last Thursday. Are you still swimming? sweating? 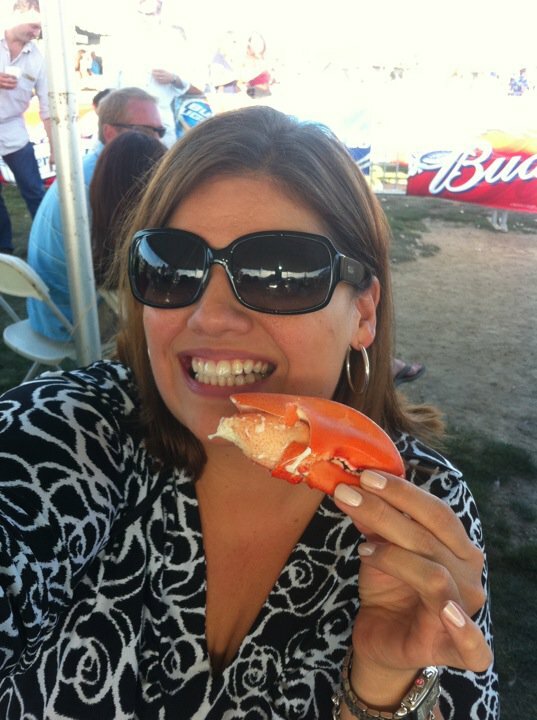 Just had to say – you look splendid in the "enjoyin' my lobster" picture! Hey Kenz, so fun to see you hosting this now. I hope my comments start to get through better though! The lobster looks fantastic! Great picture too. Oh yum now I want lobster!! I've only had lobster once or twice. Your pics make it look so yummy! Maybe I should try it again. Excited to be participating in FFM. Just a request 🙂 Is it possible to post on Sunday night? I like participating but if it is posted on Monday I usually have to skip out because I'm at work. If it goes up on Sunday I can write my post on Sunday night and schedule for Monday. just a thought! I know you are busy. Shane, the love for exercise comes and goes..As you can see from my workout log, I'm looking for it again. I WILL workout today…thanks for the encouragement my friend! So happy to have found FMM again. Thanks for hosting it! Unfortunately I can totally relate to the jacket story but fortunately I can also relate to the 'it's way too big now' story too. Yay for working towards goals and making progress. Thanks for hosting! I am new to FMM. Love hearing about your journey towards a healthier you! I love your blog… So inspiring. It's so cool to see your progress from the coat pics. SO inspirational!! Hi, I am a new follower from Friend Makin Monday! I look forward in readin your blog! Glad you are doing FMM! That lobster looks good and I don't even like seafood. Kenz, you have the most beautiful hands! You should be a hand model! (Your smile is beautiful, too).